Well, last Monday we popped in to see Laura at her Bar/alimentare in Fiano and to enjoy her delicious coffee. 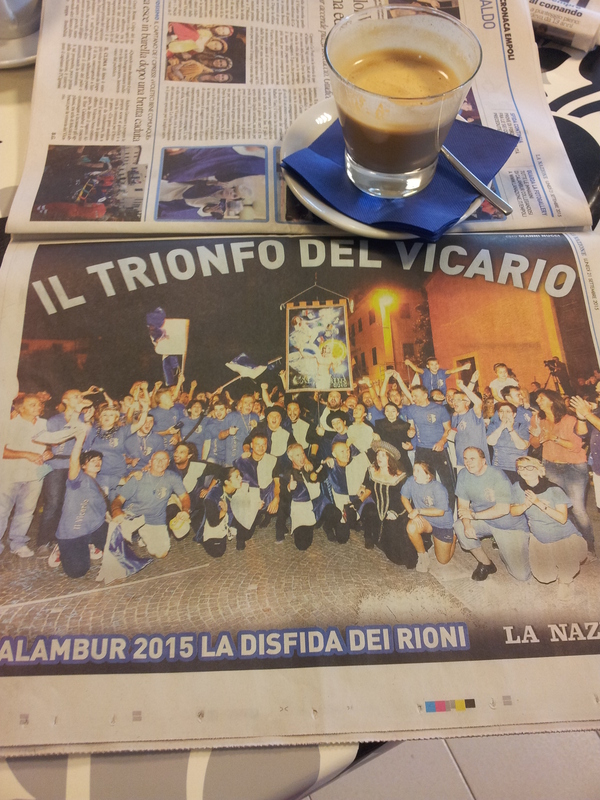 The locals were all crowding around the newspaper, reading about the Calambur contest, which had taken place the day before in Certaldo. The village of Fiano is part of the Commune di Certaldo and did compete in the ‘Its a Knockout’ style of contest, to find the top ‘quarter’ in the region. Fiano came second as the winners were from Central Certaldo and a very strong team. So the Victors were the Blue & Whites, or Viola as the locals described them. Well our favourite cafe bar in Certaldo, as you know is Bar Solferino and they are strong Viola supporters. So our visit there on Tuesday was a joyous occasion! The Vendemia, grape harvest, is near completion now and the very seasonal sweet pastry, Schiaciatta con L’uva is on all the patisserie counters in the bars and bakeries. 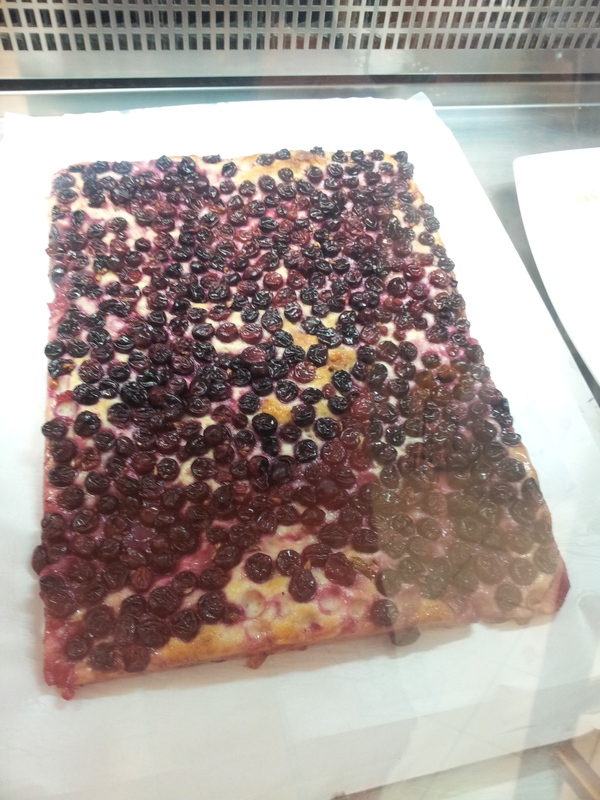 This is a flat bread baked with red grapes and is hugely popular. Italian Fashion and more handbags. Meanwhile, Milan Fashion fortnight was coming to a close and I have to say that I still think the Italians have the edge regarding design. The newspapers have been full of all the creations over the last two weeks and I could not help but share this picture with you and yes, I know, there are handbags on the page too! Back in our beautiful terraced garden we have been dining alfresco over the last couple of weeks, however, it is getting cooler now. 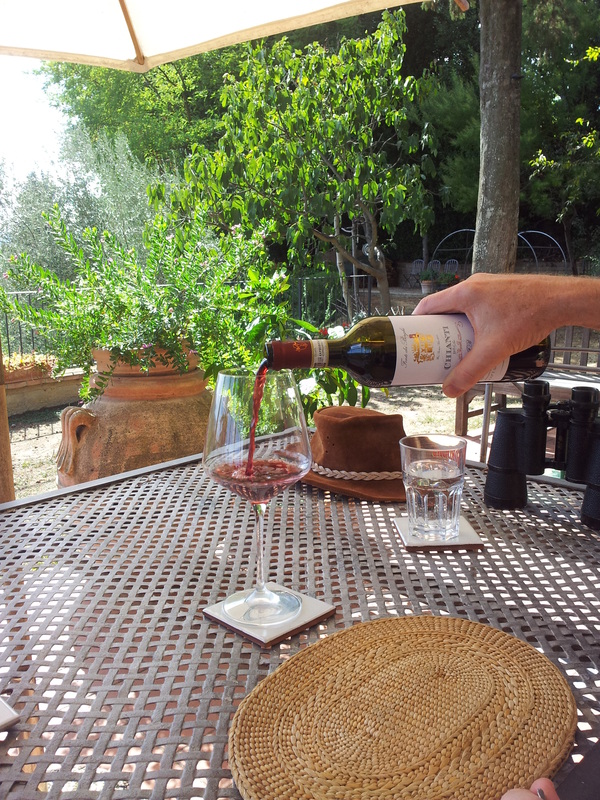 Dining Alfresco with Chianti Wine. But we are diehards and will not get forced to eat inside unless it’s seriously cold. However, my man is starting to moan; “Its freezing, look I’m wearing a fleece jacket and I’m having to put on my fingerless gloves!” However, last night a really cold wind picked up so we went and sat in a rather more sheltered spot in the garden with a different view. 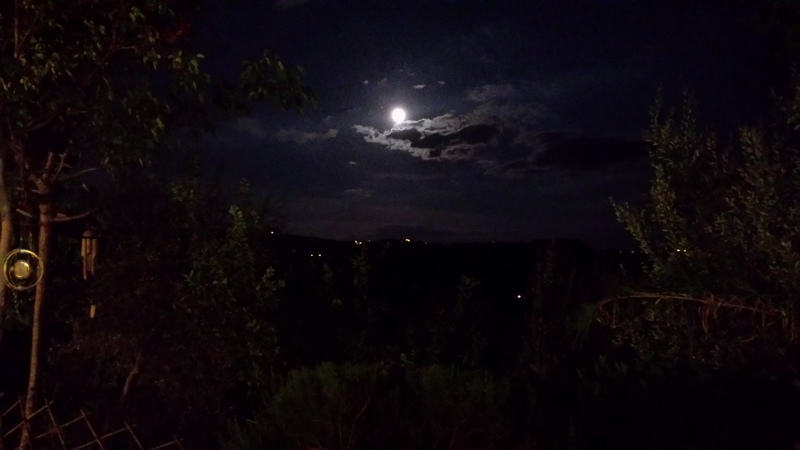 Fabulous moonscape view from our garden. Enlarge this for a better view! Wow, we were so glad we had done so because the moonscape was absolutely fabulous! We were so mesmerised that we got through three glasses of wine before hunger finally dragged us inside away from the cold.